A fungal infection can cause damage to your toenails, and likewise, damaged toenails can lead to fungal infection. This condition can be caused by poorly fitting footwear and certain medical conditions, so this type of infection is a leading cause of podiatrist visits. Fungal infections of the nails result in flaking, peeling, and continuous discomfort. Fortunately, our Medical Director at The Active Foot Spa, located in our store, uses the most advanced laser for addressing nail fungus infections. The laser is highly effective at eliminating toenail fungus infections without pain or side effects. Although it may not be visible to the naked eye, a fungal infection of one toenail can spread easily to the other toenails. For this reason, we recommend that both feet always get treated, which results in a much higher success rate of this difficult problem. The procedure only requires four 24-minute treatments, and the results are clearly visible in a short period of time, once new growth of the nail takes place. The medical term for nail fungus is onychomycosis, and it accounts for more than 50 percent of nail abnormalities. Fungal nail infections are most common in toenails. Symptoms, like discoloration and crumbling of the nail, are caused by the thickness and abnormal shape that result from the fungus being present, and these types of infections are difficult to treat because the fungus exists on the nail, beneath the nail, and inside the nail. Though estimates vary, about 10 percent of Americans have an active onychomycosis infection, and this increases to about 20 percent in people over 60 and up to 50 percent of those over 70. People with diabetes, weakened immune systems, and circulatory disorders have a higher risk of fungal nail infections, and men are more susceptible than women. If left unaddressed, the nail fungus can spread to other nails and even the skin, resulting in increased nail thickness, abnormalities, and even the loss of nails. It can also lead to cellulitis, a bacterial skin infection. The longer you ignore onychomycosis, the harder it is to get rid of. The Lunula Laser® by Erchonia is an FDA-approved method for addressing problems of fungal nail infections. The laser is the culmination of more than 10 years of research. The Lunula Laser® is unique in that it is the only true, dual diode, Class 2 laser that offers multiple benefits. 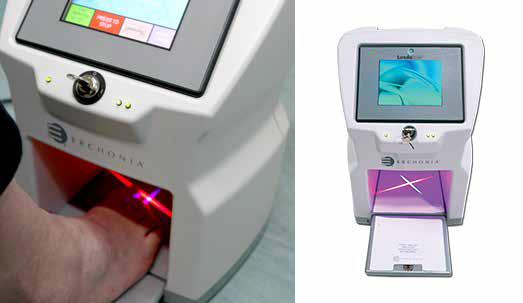 The Lunula combines the anti-fungal effects of the 405 nm wavelength with the regenerative outcomes of a 635 nm wavelength, and it is safe and painless, offering greater effectiveness without the unpleasant heat generated by other lasers. This laser is so effective because it passes through the nail, eliminating the fungal infection through photo-inactivation of the fungal cells and preventing the cells from replicating in the nail. It does all this without any side effects. The Active Foot Store is the only location in San Diego County to offer this type of laser fungal nail care. We’re located in the vicinity of University City and La Jolla, and we welcome patients from all across the country to come in and experience this highly effective procedure.